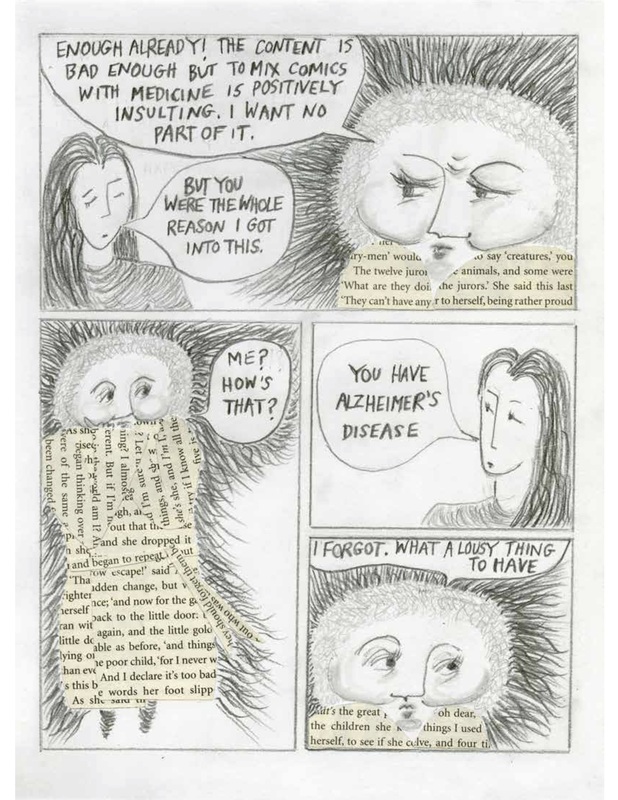 When I began my graphic memoir series, Aliceheimers, it focused just on life with my mother Alice before and during dementia. But the revelatory insight that she has retained, even during the late stages of this sickness, has led me to sometimes let the character “Alice” metamorphose into an odd sort of sage. 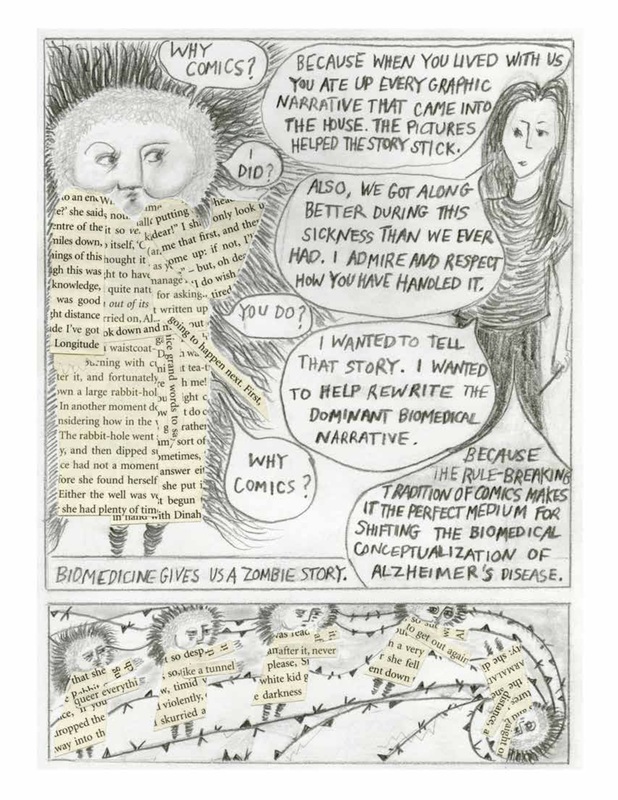 Here, she and I explore the relationship between Medical Anthropology and Graphic Medicine. 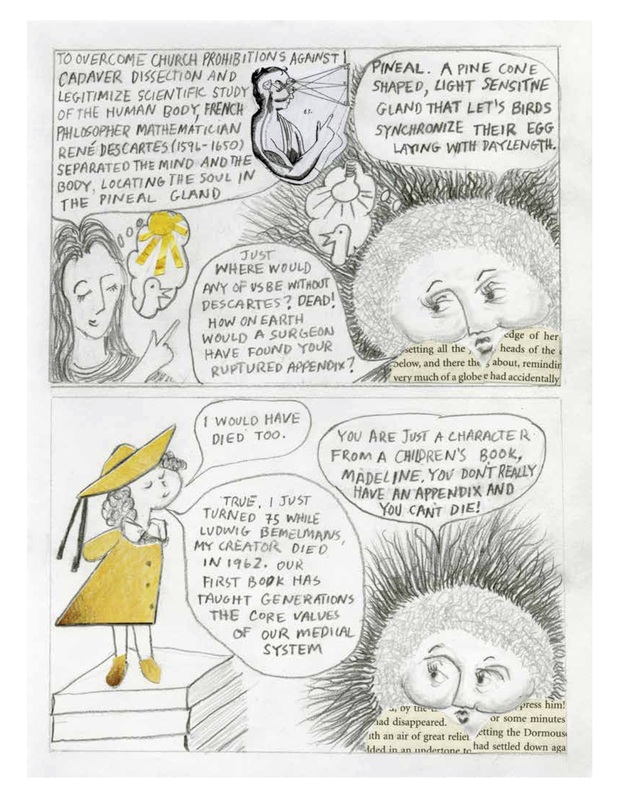 Alice’s deeply held beliefs from life before dementia combine with her mind opened by dementia, allowing me to imagine a quasi-academic conversation that we never could have had in real life. A writer, artist and anthropologist, Dana Walrath likes to cross borders and disciplines with her work. 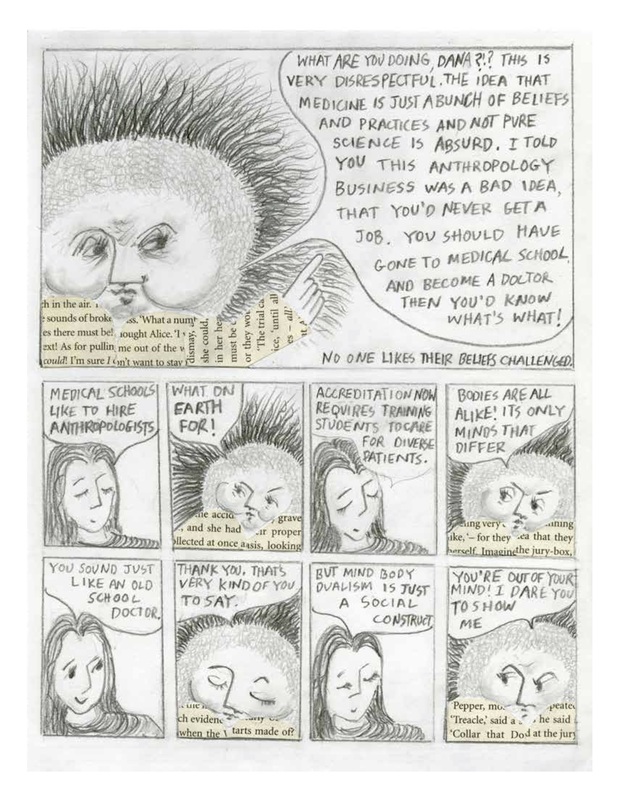 After years of using stories to teach medical students at University of Vermont’s College of Medicine, she turned to writing her own. Her award winning verse novel, Like Water on Stone, was completed during the year she spent as a Fulbright Scholar in Armenia. 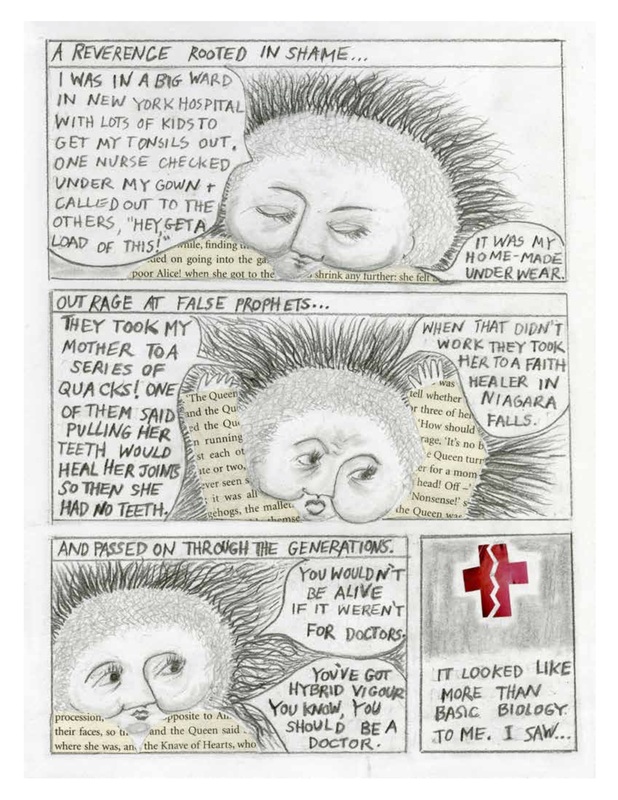 Her recently released graphic memoir Aliceheimer’s has brought her throughout North America and Eurasia to speak about the role of comics in healing including talks at TEDx Battenkill and TEDx Yerevan. Her recent essays have appeared in Slate and Foreign Policy. You can visit her at danawalrath.com. 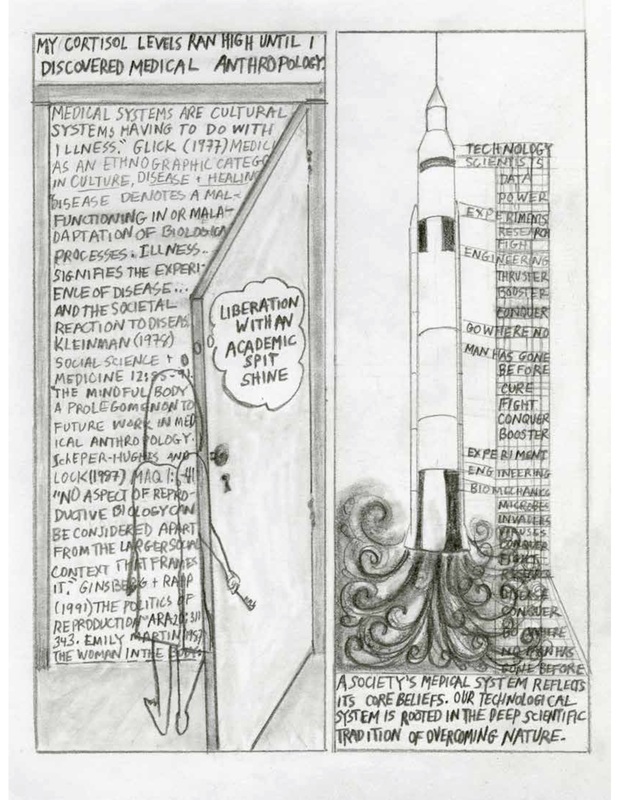 Image: Two kinds of family trees: comics (Mickey Mouse ears) and medicine (medical text) combine to form graphic medicine; biological and cultural anthropology (represented by book spines with names of some anthropological sages like Boas, Kroeber, Mead Leakey, Levi-Strauss) combine to form “Medical Anthropology”. These two form “an exogamous marriage”, or break out into “paraphyletic groups?” Two independent family trees each with their own history. Byline: Dana Walrath, University of Vermont. Alice, an older woman with round face and curly hair. Her clothes throughout the text are made up of cut-up pages from Alice in Wonderland. Alice imagines an exoskeleton and endoskeleton, and eggs and sperm (thinking the word “gamete”). 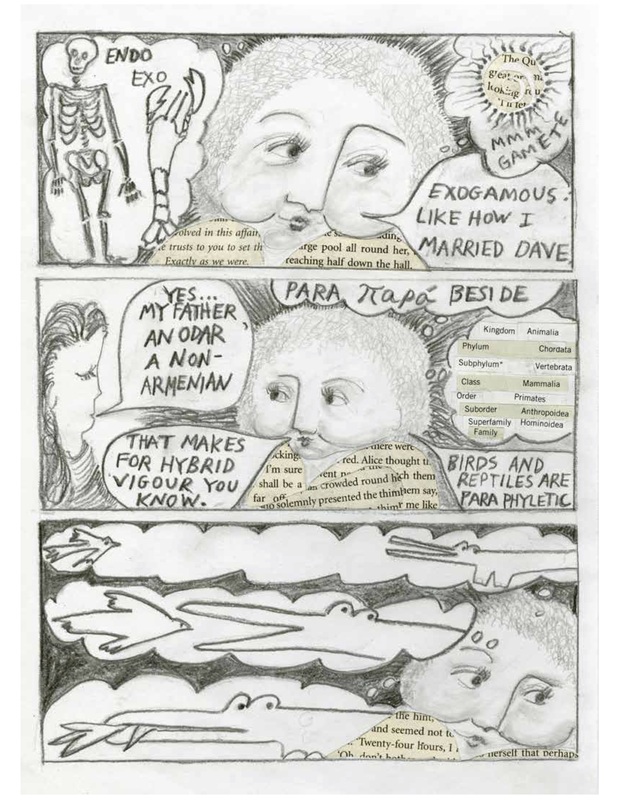 Alice imagines Greek root “para”, meaning “beside”, and relationships among vertebrates. Alice imagines a crocodile eating a bird. 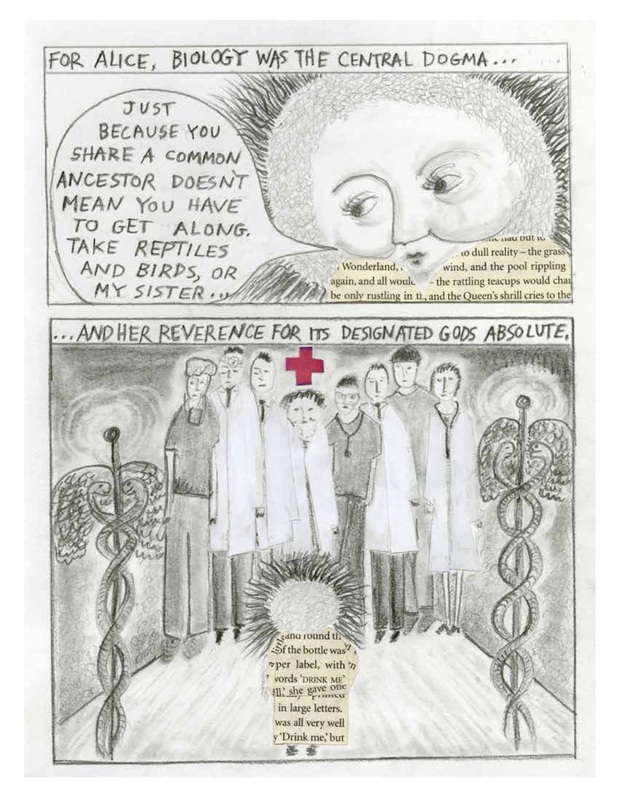 Alice stands in reverie before an array of white-coated doctors flanked by two staffs of the god Hermes, the Caduceus, instead of the correct Rods of Aesclepius, as though they were a pantheon of false gods. Narration: That was a prenatal visit with the student health obstetrician. I chose midwives after that. Humiliation: Dana wears an open-backed hospital gown and stands on a scale. A rocket ship taking off. Launchpad scaffolding made of words that are part of the scientific approach of biomedicine: technology, scientists, data, power, experiments, research, fight, engineering, thruster, booster, conquer, go where no man has gone before, cure, fight, conquer, booster, experiment, engineering, biomechanics, microbes, invaders, viruses, conquer, fight, research. Panels 2 through 9 of 9. Argument back and forth between Alice and Dana. Alice and Dana’s conversation continues. Above Alice, an image of a lightbulb and a bird, contrasting with the sunlight/bird image above Dana. Alice conversing with Ludwig Bemelmans’ children’s book character, Madeline. Dana hanging upside-down from a tree branch. Alice and Dana have calmed down. 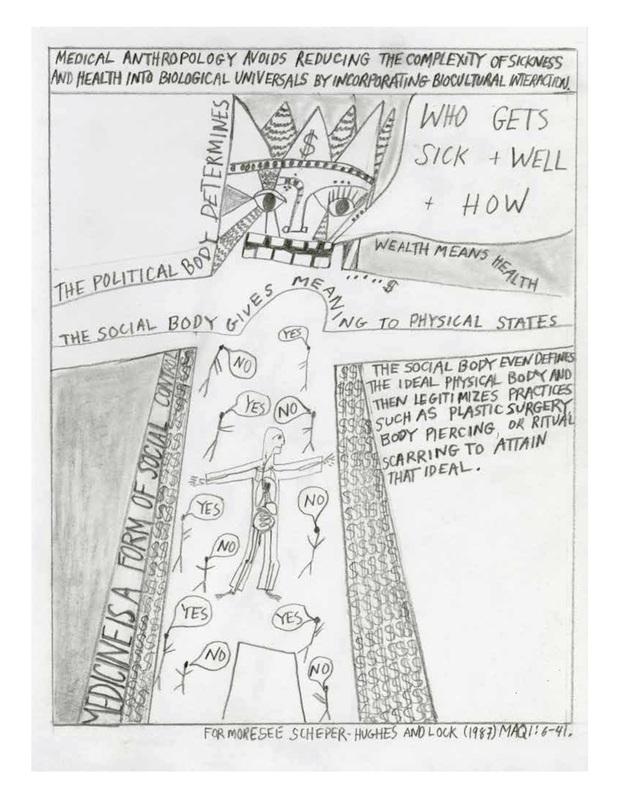 Image: Three nested figures: the political body as a looming monster, arms outstretched, decorated with dollar signs; inside, a human body (the physical body) with guts visible, surrounded by other stick figures that say “yes” or “no” representing the social body. Dana and Alice conversing. 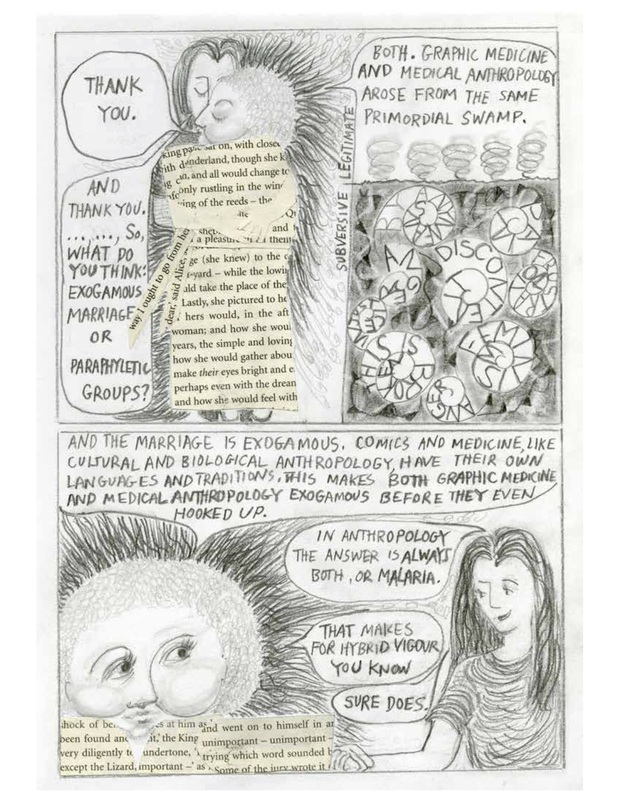 Levi-Strauss’s magic field diagram embedded in Dana’s speech balloon. 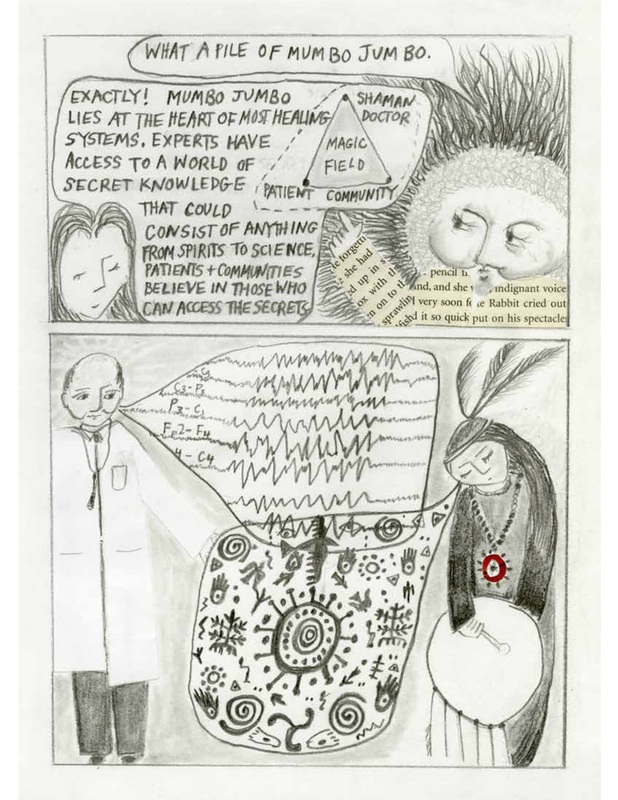 A shaman with spirals, hands and other iconography in his speech balloon overlapping with that of an MD who has an EEG read-out in his speech balloon. Alice falling down a zombie spiral. A white-coated doctor runs past, says “Quick! To the lab!”. Image: A spiral with squares marking biological birth and death. Image: Alice travels around the sun. Panel 3 of 3. Alice and Dana hold hands and smile. Alice: “That makes for hybrid vigour, you know. 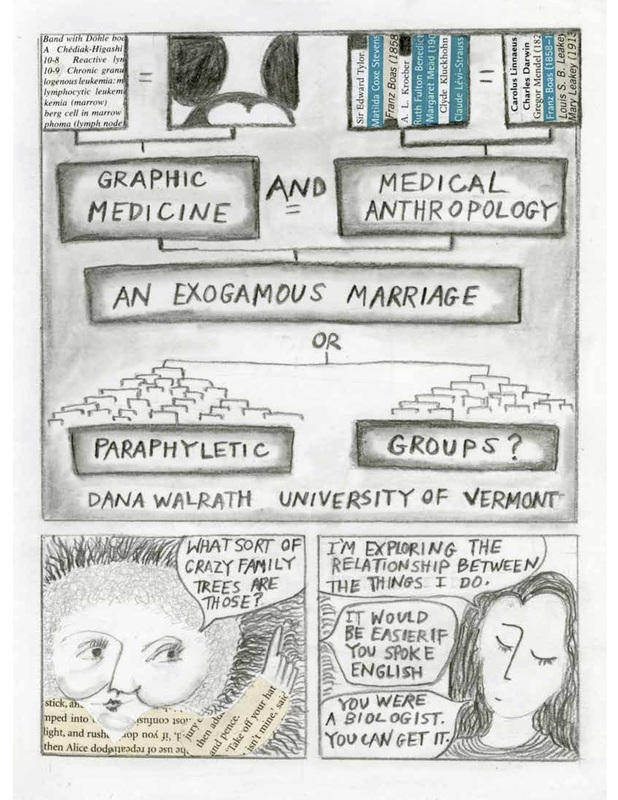 Walrath D. Graphic Medicine and Medical Anthropology. Somatosphere. 2016. 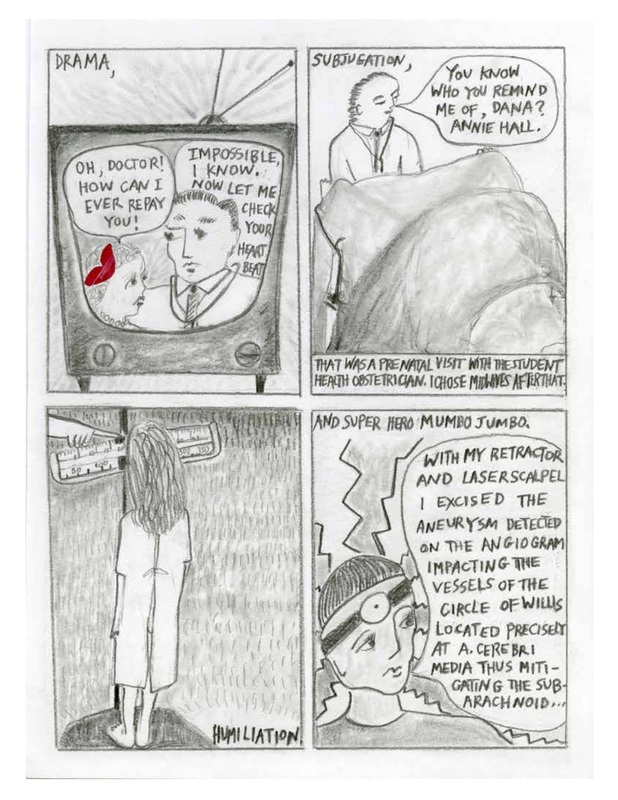 Available at: http://somatosphere.net/2016/graphic-medicine-and-medical-anthropology.html/. Accessed April 25, 2019. Walrath, Dana. 2016. 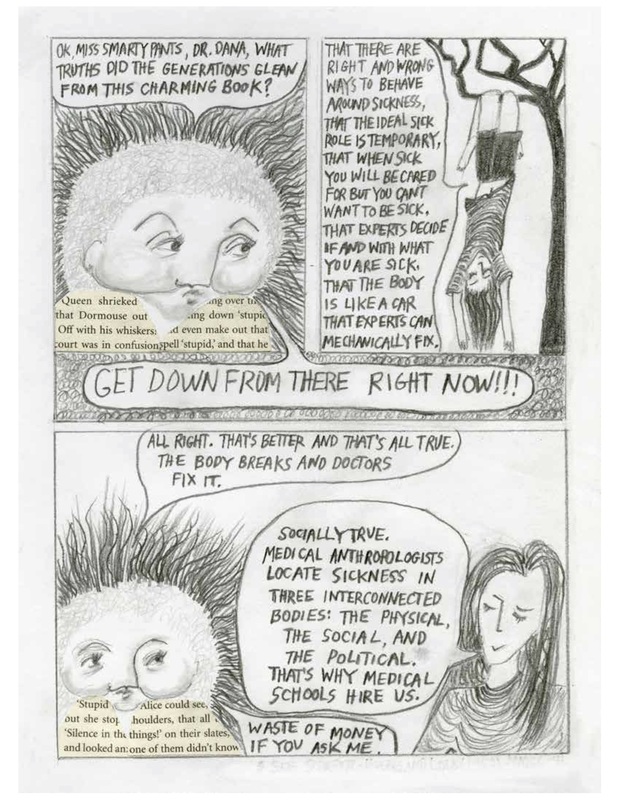 Graphic Medicine and Medical Anthropology. Somatosphere. 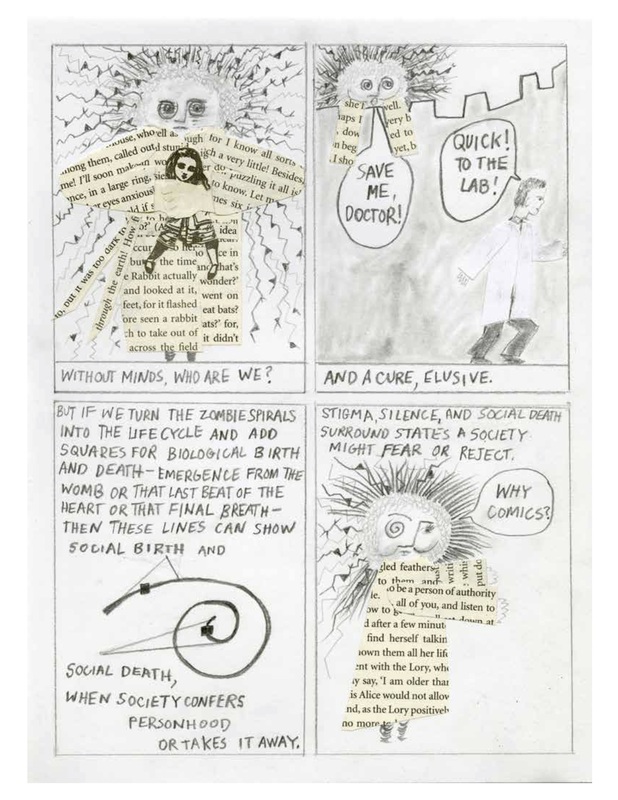 http://somatosphere.net/2016/graphic-medicine-and-medical-anthropology.html/ (accessed April 25, 2019). This is fabulous! 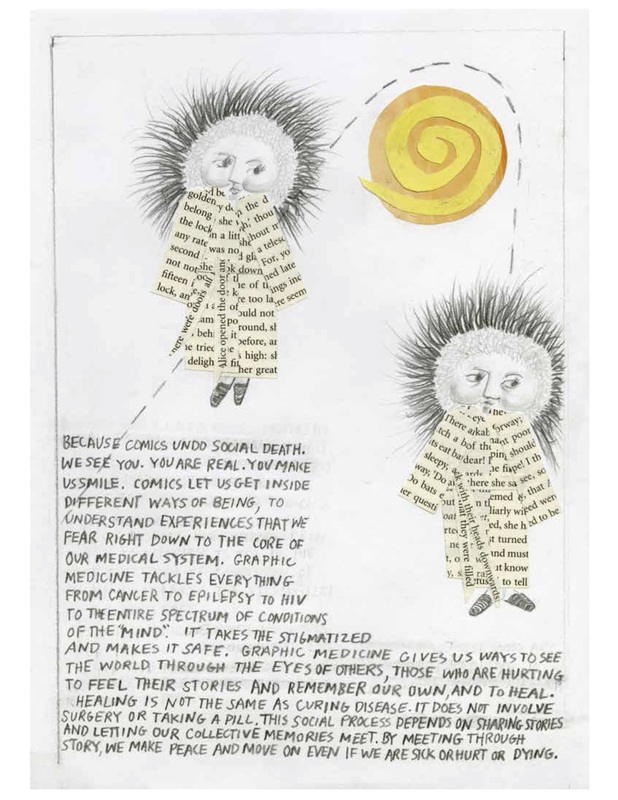 Really love it – and I’m not a great fan of graphic novels (much as I love Roz Chast’s recent book about her folks and dementia – Can We Talk About Something More Pleasant) – keep up the great work.